This stack limestone pond has nice straight lines for a simple look. I love the triple waterfall. Like all Commercial pond construction projects it all starts with the pond design. In this project it is all about the technique and expertise of the pond contractor. 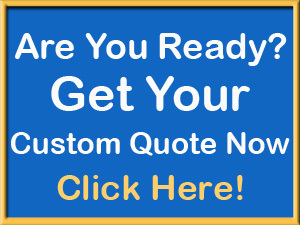 The most important issues we see the most with so many pond builders whether owner builders or professional Commercial pond construction companies is just getting everything level.. Seems simple but it happens so much – it is crazy! Every level from the top pond to the bottom level must be absolute level. This pond is using a pond liner but does not include any cement to hold the rocks together. So it is important to make sure every rock is placed just right so it will stay in place .. forever. hopefully. Commercial Ponds and Waterfalls are so beautiful seems like a great idea for a commercial spot to add some sound and elegance. Using just the right pond pump for each pond installation is very important. If there is too much water going over the waterfalls it might spill out and make the Fish pond or koi pond leak. 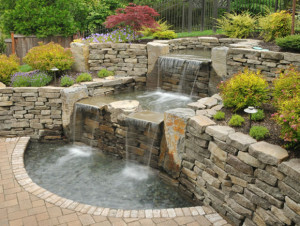 On the other hand if it is not enough water the triple waterfalls on this custom pond will not look custom at all. It will not flow over the rocks but dribble in places that will not look nice.